New broadcast deal will bring live coverage of every Cage Warriors event to fans in Belgium, Luxembourg, Poland, Singapore and Taiwan. Cage Warriors are delighted to announce a new broadcast deal with ELEVEN SPORTS to extend Europe’s premier mixed martial arts promotion to new TV markets across Europe and Asia. The new multi-year deal will see all 10 of Cage Warriors’ 2017 events broadcast live across ELEVEN SPORTS’ channels in the aforementioned territories, starting with Cage Warriors 80 at Indigo at The O2 Arena in London, England. The agreement will also see ELEVEN SPORTS taking on a key role in the commercial organisation of key events, with the two parties looking to work together to bring new events to the key markets served by the broadcaster. The deal will see Cage Warriors events broadcast alongside some of the biggest sports events and leagues in the world, including the Premier League, La Liga, The FA Cup, Formula 1, the NBA and the NFL. Casimir Knight, CEO of Warrior Development Agency, parent company of the Cage Warriors Fighting Championship, said: “We are committed to bringing the action and excitement of Cage Warriors to MMA fans across the world. “We’ve struck a number of key partnership deals in the past 12 months to help achieve that aim, and our deal with ELEVEN SPORTS is a clear sign that we’re continuing to expand and break new ground in 2017. Cage Warriors now has broadcast partnerships in more than 20 territories globally, including BT Sport in the UK and Ireland, Setanta in Eurasia and Viasat in Scandinavia, as well as worldwide streaming via UFC Fight Pass. 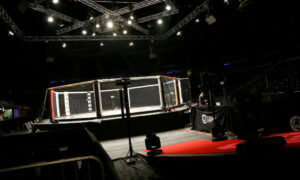 Group Managing Director of ELEVEN SPORTS Danny Menken said: “We are delighted to add such a prestigious mixed martial arts property as the Cage Warriors Fighting Championship to our growing portfolio of rights, bringing top-class fight sports to fans across all of ELEVEN’s territories.